• [03 August 2009] Prince Charles Hospital reported that the facility had three Extra- Corporeal Membrane Oxygenation (ECMO) stations in operation, all three of which were in use by patients with confirmed Pandemic (H1Nl) 2009. • [04 Jnl 09] Townsville HSD reported that dne to an increase in Pandemic (HlNl) 2009 related Emergency Department presentations, an Emergency Department annexe wonld open to fast track mild cases. • [30 Jul 09] Townsville HSD reported a youth at Cleveland Detention Centre was displaying influenza like symptoms. The inmate was swabbed, isolated and commenced on Tamiflu, with ten further courses of Tamiflu supplied to the Centre’s nurse. Two further suspected cases have been swabbed, administered Tamiflu and isolated. On Tnesday, 04 Angnst 2009, Townsville HSD reported two positive cases of Pandemic (HlNl) 2009 at the facility. • [03 Aug 09] Central Queensland HSD reported a total of eight confirmed of Pandemic (H1N1) 2009. • [31 Jul 2009] Longreach has now reported their second confirmed Pandemic (H1N1) 2009 case. The patients are one tourist and one local, and neither have required admission to hospital. • [30 Jul 09] Central West Health Service District reported the district’s first confirmed case of Pandemic (H1N1) 2009. • [04 Ang 09] Torres Straight HSD reported that the PNG/Anstralian border (for the purposes of the Torres Strait – PNG treaty) had been re-opened last Wednesday, 29 July 2009, at 0900 AEST. on the 30 and 31 July 2009. • [03 Aug 09] Cape York HSD has assessed data of confirmed cases and it is apparent that communities in Cape York have community transmission of Pandemic (H1Nl) 2009. As such all of Cape York HSD will move to PROTECT on Monday, 3 August 2009. On Friday, 31 July 2009, the Cape York HSD advised that the Indigenous Community of Hopevale is moving to the PROTECT phase due to an increase of community transmission of the Pandemic (H1Nl) 2009 virus. Where relevant for those communities with low numbers of community transmission, sentinel surveillance mechanisms will continue to be implemented and early treatment institnted, especially for vulnerable groups. • [03 Aug 09] Cape York HSD will receive the services of a temporary fly-in nurse to assist in the response to Pandemic (HIN1) 2009. • [29 Jul 09] Cape York HSD is reporting the towns of Weipa and Cooktown moved from the CONTAIN phase to the PROTECT phase due to increased community transmission of the Pandemic (H1Nl) 2009 virus. Other outlying areas of the Cape York region (excepting Pormpuraaw) remain at the CONTAIN phase. • [29 Jul 09] The Cape York HSD are reporting 82 confmned Pandemic CHlNI) 2009 cases across eight communities. To mitigate the impact of the virus on the communities, Queensland Health are undertaking media activities across the region, and letterbox drops in Weipa and Cooktown communities. • [04 Aug 09] Mt Isa HSD advised that effective Saturday, 01 August 2009, the whole of the Mt Isa Health Service District would move to PROTECT Phase. • [03 Aug 2009] Mt Isa HSD has reported that the Mt Isa Population Health Unit and the Mt Isa City Council are liaising and in the process of producing various media for the public concerning Pandemic CHINI) 2009 at the forthcoming Mt Isa Rodeo. • [31 Jul 2009] Rodeo 7-9 August expected to increase presentation at ED. • [29 Jul 09] Cairns Base Hospital has established a triage area at the entrance of the Emergency Department as of Tuesday, 28 July 2009. The area is staffed from 0700 to 2300 hours and is intended to section off an area for those who present with Influenza-Like Illness from other ED patients. • [03 August 09] A 25 year old Pacific Islander male with a significant medical died within a few hours of presentation at Gold Coast Hospital. He presented with a three day history of febrile ILl associated with increasing dyspnoea. His death has since been verified as Queensland’s eleventh Pandemic CHINI) 2009 related fatality. 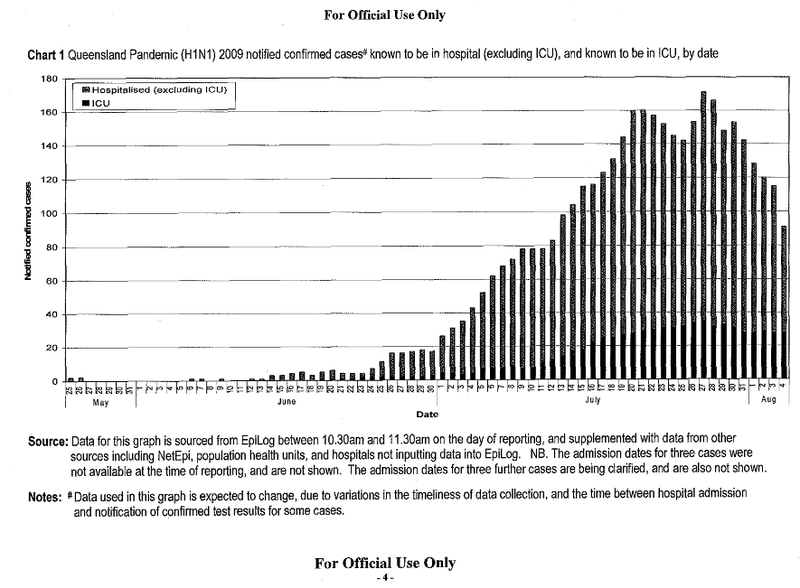 • [02 Aug 09] Queensland has reported its tenth Pandemic CHlNl) 2009 related death in a Townsville hospital of a 54 year old woman. The patient had underlying medical conditions. • [31 luI 09] Queensland has reported its ninth Pandemic CHINI) 2009 related death in a Brisbane hospital of a 30 year old woman. The patient suffered multiple underlying medical conditions. 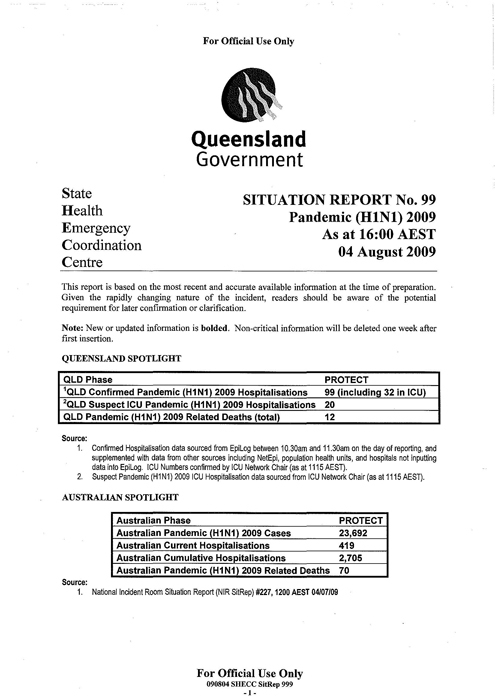 • [30 Jul 09] On Wednesday 29 July, Queensland reported it’s eighth Pandemic CHlNI) 2009 related death of a 58 year old male at Princess Alexandra Hospital. The patient had underlying medical conditions. This death was not reported in NIR SitRep #222. • [29 Jul 09] Queensland has reported its seventh Pandemic CHINI) 2009 related death in an 82 year old female patient in Townsville. The patient suffered underlying medical conditions. • [04 Aug 09] Mt Isa HSD reported that effective Saturday, 01 August 2009, Flu Clinics in Outpatient Departments were suspended. Presentations will be monitored through the Emergency Department and the clinic will re-open should nnmbers increase. • [30 Jul 09] Darling Downs- West Moreton HSD reported that a flu clinic would open on Tuesday, 4 August 2009, in Toowoomba if the current level of emergency activity continues.